Mad for Monaco: Prince of Hanover Has to Pay Up! Prince of Hanover Has to Pay Up! HRH Prince Ernst August V of Hanover, the wayward husband of Princess Caroline, has been fined $270,000 for assaulting a hotelier in the Republic of Kenya. The court tried to say that this was not a win or a loss for the prince, that there were no winners, only losers as the hotelier did not get all of the damages he was seeking nor did the Prince of Hanover get the acquittal he was looking for. I have not been a fan of the Prince from day one and to a considerable extent this problem is one of his own making, however, from all I know of the case, it seems to me the Prince was targeted by someone seeking to cash-in on a wealthy royal known for courting scandal and having a short fuse. To review, Prince Ernst August and Princess Caroline were staying at a hotel in Kenya and were not given the accommodations they thought had been agreed upon. The Prince complained they were being disturbed by the noise and lights coming from the hotel disco. 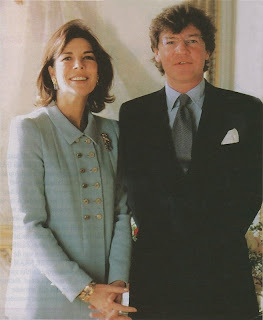 When the hotelier refused to make it right, by refund or changing accommodations, the frustrated Prince, according to his testimony and that of Princess Caroline, slapped the man lightly (symbolically it was said) twice about the head. I think it is noteworthy that the police in Kenya were never involved but the hotelier, also a German national, took the case to Germany where he suddenly claimed to have suffered severe injuries and trauma, claiming the Prince had severely assaulted him, beating him with knuckle dusters. Now, again, the behavior of the Prince has been deplorable on a number of levels but this case has always seemed trumped up to me. The court ruled as it did because it said it could find no way of judging the word of one man against another (of course Princess Caroline did testify -I do not know if anyone did so for the hotelier) but the facts fail to add up for me. If the man was so seriously injured why did he not immediately contact the Kenyan authorities? Why did he not pursue the case there, where it happened, instead of going home to Germany to sue? This has always seemed to me like someone out to make an easy buck by exaggerating his injuries to cash-in on a prince known for his bad behavior in a country where he has a reputation and not known for being exceptionally friendly towards its former royals. However, reports are that the Prince can appeal the conviction and have a new trial. Well, maybe he's just the sort who's easily offended and holds a grudge. Still, something tells me if this had been some regular joe with no money he wouldn't have gone to so much trouble over it. No matter how rich people are they always still would like to be richer.